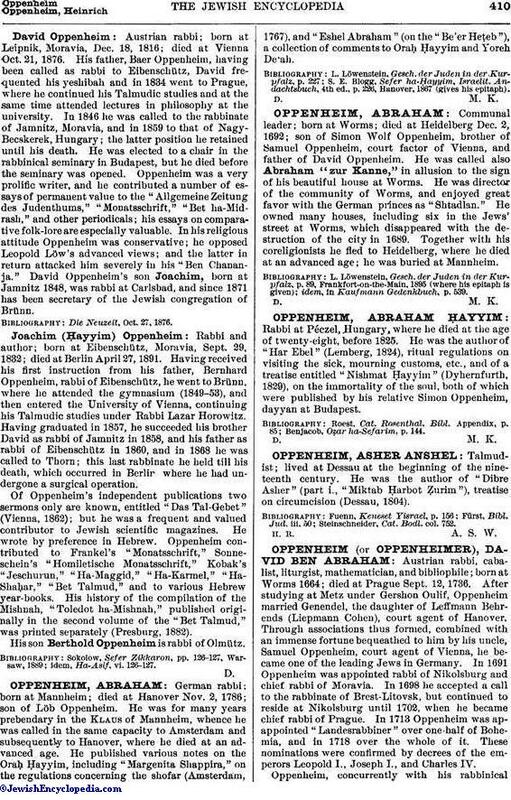 German rabbi; born at Mannheim; died at Hanover Nov. 2, 1786; son of Löb Oppenheim. He was for many years prebendary in the Klaus of Mannheim, whence he was called in the same capacity to Amsterdam and subsequently to Hanover, where he died at an advanced age. He published various notes on the Oraḥ Ḥayyim, including "Margenita Shappira," on the regulations concerning the shofar (Amsterdam, 1767), and "Eshel Abraham" (on the "Be'er Heṭeb"), a collection of comments to Oraḥ Ḥayyim and Yoreh De'ah. S. E. Blogg, Sefer ha-Ḥayyim, Israelit. Andachtsbuch, 4th ed., p. 226, Hanover, 1867 (gives his epitaph).